re: "Just out of curiosity, is there any major character in the DC Universe definitely shown as being Jewish? Several months ago, several people listed Jewish characters in other universes, but I don't recall any in the DCU." Pre-Crisis, Colossal Boy (now Leviathan) of the Legion of Super-Heroes was portrayed as Jewish. Nuklon of the Infinity Inc. and the JLA is Jewish. Ragman is Jewish. To keep this on topic (sorta), why are most heroes not as religious as they could be? ...the only really religious person that's sane that I recall in DCU is Huntress, and I guess Wonder Woman... Anyone else...? I don't know that religion is really ignored in comic books. I'd say it turns up at least as much as it would in a regular series of novels or a TV series. More so, even. Very little religion in the DCU - there seems to be a pervading non-denominational deist philosophy (Spectre is an agent of God, but let's not be specific about what religion for fear of alienating the others). Huntress presumably Catholic by reference to crucifix. Pre-Crisis Superman presumably nominally a member of the Kryptonian religion (whatever that was) by virtue of his frequent "Great Rao!"s. A bit tricky to address religion in a universe where there is quite a high preponderance of actual Gods! I am a Christian... There is a reason there is no Christian superhero. Same reason as there is no real Jewish [superhero]... that flaunt their religion or fight for religious belief specific notions. It's because they would be offensive to many, if not most, of the readership. Besides -- Zauriel, Bloodwynd, Wonder Woman, the Spectre, the Quintet, etc., etc., are all based on or are slaves to religious beliefs, but none actively flaunt it, or debate which is correct, so a hard-line Christian super hero would probably not sit too well. Well, I'm gonna hit you. Nightcrawler, Daredevil, [4 other Christian superheroes] are all Christians. Sabra, Seraph, Ramban, Atom-Smasher and the Thing are Jewish... Many of them have debated their beliefs in the comics - as you say, not the hardline way, but that is definitely not the same as saying that they are not Christian superheroes [or Jewish superheroes], or that they are not devoted. I thought one of the most interesting aspects of Infinity Inc. was the way Roy Thomas portrayed the characters' various religions and how they influenced the characters lives. Seeing the characters praying, lighting candles for loved ones, having Bar Mitzvahs, made them more human to me than characters in most other funny books ;). Sure religion is controversial and people believe different things on both sides of the 4th wall but I find it interesting to see it having such a keen role in the lives of young people who might otherwise seem silly because they choose to run around in tights instead of trying to lead "normal" lives. And even though I may never know what Roy Thomas' religion is, it showed me what an important role his beliefs had in his own life :). Seems that atheistic heroes are as rare in comics as in real life. If they are religious it's a sort Judeo-Christian wishy washy sort of religion... Any other examples of guesses? 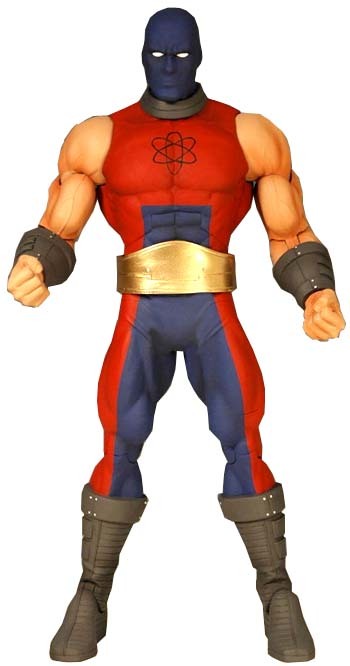 Nuklon, formerly of Infinity, Inc. and Justice League America, is Jewish. That's the only one I can remember. The Golden Age Sandman was just revealed to be half-Jewish. And I recall that Nuklon was strongly Jewish in the final issues of one of the recently axed JL [Justice League] titles. Incidentally: If anyone out there is interested in starting a Web site devoted to Jewish spins on comic books, please e-mail. I have Web space I can make available for that purpose. In relation to question 6: as a Jewish comic book reader, I look around a great deal for any sign of Jewish stuff in comics. It's a habit. Things like the upcoming Sgt. Rock mini about rescuing the rabbi in Eastern Europe are few and far between. Interestingly, the three highest profile Jewish characters at Marvel--Kitty Pryde, the Thing and Moon Knight--have a mini-series, an ongoing and an upcoming ongoing, respectively. On the DC side, Ragman is in the Shadowpact ongoing, but otherwise, Atom Smasher is in jail and... that's it. No one's heard from Seraph and Hayoth for years, and I think I'm the only person that considers Black Canary to actually be Jewish (I have my reasons). 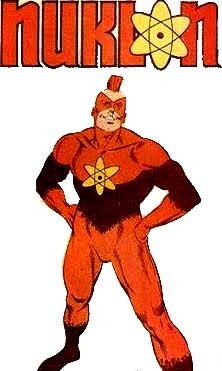 Atom Smasher could become a player in OYL considering his current imprisoned status and his apparent recruitment by Amanda Waller. As for Jewish themes in writing, the legend of the Golem has influenced a number of characters, most notably Marvel's Thing. Ragman ... A smelly homeless dude with possessed shmatas, great. Golden Age Atom ... A short little tough guy. Very much like the short little asskicking boxer (Jake Barnes?) in THE SUN ALSO RISES...I buy that he's a Jew. ...What is the religion of the heroes we read about?... Don't get me wrong, not picking on anyone, just wonder what everyone thinks what our heroes believe... (maybe a moderater can have some imput..?) ....other threads touch on the subject in passing, time to discuss it! ...when was it established that Ray Palmer is Jewish? I know Atom Smasher (Albert Rothstein) is Jewish, but the Atom? Ray Palmer isn't Jewish. This was clearly established in the original JLA series where his Jewish friend invites him to a Hannukah celebration. Atom Smasher on the other hand is Jewish. They're out there. But, once again, as with your examples, they tend to be supporting characters. The Spectre is probably the best example of an overtly relgious hero that DC has ever had. Jim Corrigan's talks with Father Cramer and his worldview are clearly deeply (and sometimes disturbingly) religious. But there are many other examples. Atom-Smasher comes to mind. Sure, they [Siegel and Shuster] were Jewish, but that doesn't make the character [Superman] Jewish. The JL/JLU [Justice League/Justice League Unlimited] version is definitely not Jewish. Oh hold on, I'll find that website someone pointed me to the other day...at this point, with everyone treating me like comics are the only thing I'm interested in, I don't even know if the link was given to me by someone off the board or on. which points out a few Jewish heroes that, y'know, SAY they're Jewish. Thanks to Jack G. for this. And I so admire The Acidic Jew [link to: http://www.adherents.com/lit/comics/AcidicJew.html]. JSA #2 (Sep. 1999): "The Wheel of Life"
JSA #11 (June 2000): "Split"